2012/13 T-Mobile Ekstraklasa season was the very first to see all three stadiums of Euro 2012 used in all home games (fourth one in Warsaw has no club tenant, only national team). Previous campaign saw Śląsk Wrocław moving in their new arena late, while Lechia Gdansk and Lech Poznan were already getting comfortable. Unfortunately each of them saw thousands of empty seats at each game of the tournament. Gdansk’s PGE Arena is in the worst position as its 30.3% attendance rate is the worst in all of Ekstraklasa. Of over 43,000 seats offered only 13,206 were filled regularly, meaning a decrease by 4,111 spectators per game, compared to PGE Arena’s opening season. It also means the stadium’s revenue is well below profitability. Also in Wroclaw a significant decrease was seen despite Śląsk, last season’s champions, fighting for the title again and only losing their chance late into the season. Stadion Wrocław was filled in 34.9% or 15,119 people per game. 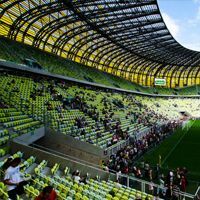 That may be a lot more than at the outdated Oporowska stadium (holding just over 8,000 people), but also short of generating profits for both the team and municipal management company. The 2012/13 number also falls short of previous campaign’s attendances, 1,509 viewers less at each game. Lech Poznan did much better than the other Euro-stadium host clubs. Fighting for the championship until almost the end of the season, Lech was able to catch one sell-out game, against Legia Warszawa and an overall attendance of 22,641 people per game. That’s Poland’s best result by far and also a massive 49% increase for Lech. The numbers confirm what many critics have been saying for months – the clubs that received new stadiums in recent years didn’t do enough to profit from the ‘new stadium effect’ to boost their attendances in the long run. Even Legia, crowned champions after their last game, saw crowds of under 60% and an almost 3,000 decrease on each game’s turnout. Wisła Kraków barely managed to get through the 40% mark. Overall average attendance for the Ekstraklasa doesn’t look too bad, though. It currently stands at 8,314 people per game, slightly less than a year before (8,741) and football governing bodies PZPN and Ekstraklasa claim that central authorities and their vision of stadium safety are mainly responsible for the decrease. Since pre-Euro 2012 preparations, legislation has been tightened to levels rarely seen in other countries, allowing the police to impede matchday atmosphere and even prosecute people for using a single curse word. To get into a stadium each fan needs to have an ID card similar to the Italian ‘Tessera del Tifoso’ with security requirements being among the most restrictive worldwide. In January PZPN and Ekstraklasa SA appealed for more flexibility in the execution of the law, seeing that most stadium bans are imposed for minor faults, not for acts of actual hooliganism they were supposed to tackle. Many fans find it too much of a hustle to attend games at home, not even mentioning away travel. However, to date the Ministry of Interior showed no interest in the appeal, despite 4 months having passed. For full resolution infographics please visit our facebook page!